New armor protects against 8 g (124 gr) 9x19mm Parabellum Full Metal Jacketed Round Nose (FMJ RN) bullets at a velocity of 373 m/s ± 9.1 m/s (1225 ft/s ± 30 ft/s) and 11.7 g (180 gr) .40 S&W Full Metal Jacketed (FMJ) bullets at a velocity of 352 m/s ± 9.1 m/s (1155 ft/s ± 30 ft/s). Conditioned armor protects against 8 g (124 gr) 9 mm FMJ RN bullets at a velocity of 355 m/s ± 9.1 m/s (1165 ft/s ± 30 ft/s) and 11.7 g (180 gr) .40 S&W FMJ bullets at a velocity of 325 m/s ± 9.1 m/s (1065 ft/s ± 30 ft/s). 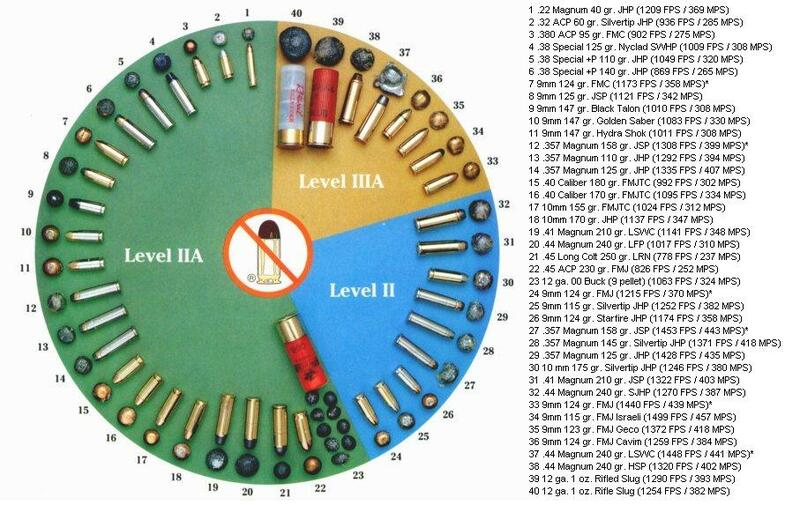 If you are going to get a vest, your best bet is to get a Level IIIA (or higher if you are worried about rifles) just to be safe and cover all the bases.